Tom has been a photographic hobbyist since 9 years old when he was given a Kodak Flash Six-20 for Christmas. He worked for the Bell System as a technician for 40 years. After he retired, Tom did a short 5 year stint as the director of a small Earth Science Museum. He started collecting Yashica TLRs after he purchased a Yashica Mat-124G to take baby photographs of his daughter. Then took baby portraits for friends and relatives. He started doing wedding and sitting portrait photography when a friend who owned a studio offered him freelance work. He also shot executive portraits and business photographs for various companies in New York City. Tom used Nikon 35 mm F2 and F3 film cameras. During his semi-professional free-lance career, Tom modernized his equipment and moved up to a Nikon F4 and auto-focus lenses. Just before digital entered the market as a serious contender to 35 mm film, Tom purchased a Mamiya AF system, he is shown here with his Mamiya 645AF. Tom really enjoyed shooting with medium format. Before long it became clear that digital was quickly replacing film. A digital back for the Mamiya 645AF never materialized so Tom traded in everything he had for two Nikon D100's and a few new Nikon AF lenses. Eventually the D100's were traded up to D200's. Tom is now an official senior citizen and still collecting cameras; Yashica TLRs for the most part and other cameras that have struck a nerve, Spartus Press Flash cameras and Argus C series “bricks” to name a few. His primary working cameras are now two Nikon D7100s and a D5300 in the studio and still shoots film every now and then with a Nikon FE2. He develops black & white film himself and then scans it with an older Nikon D8000 scanner. It's getting tough to find anyone who will develop 120 and 35 mm film. On occasion Tom likes to run a roll of color through an old Diana or a Yashica TLR. Tom chairs his county Senior Citizen Camera Club where he now lives in the southeastern part of the USA and still tries to get out and shoot from time to time. Göran’s father was a very serious amateur photographer and that is where his interest developed from. His first camera, in 1959, was an Zeiss Ikon Nettar 6x9cm. This was followed by a number of small format cameras, mainly Nikon, including F2 and F3 models. He prefers to work with manual focus lenses and most of the time shoots black and white film. He bought his first TLR, a Rolleicord 3.5, from a friend in 1985. This was used sparingly and sat in his closet most of the time. The small format cameras were more practical in use - easier to carry and find film for. 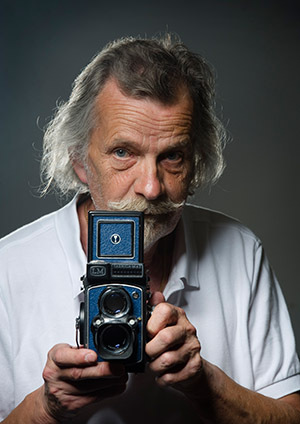 In 2003, Göran found more time to pursue his hobby and bought a Yashica-Mat which was not working too well so he decided to repair it – he found that this was a very interesting job and it turned out quite successfully! Now he started to use the TLR cameras more frequently. And more Yashicas were bought, mostly broken ones - just for the repair! Today, he has a small collection of 20 plus Yashicas of various models - all working and used quite often. To these he has added a Mamiya 645, several more Rolleicords including a Va and a Rolleiflex 2.8E. 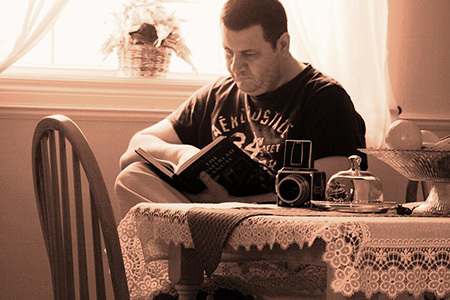 Sandu is a Romanian born Canadian who together with his wife, Alina, already have a very complete Yashica collection but also a determination to track down the hard to find last few. However, the Yashicas are part of a bigger collection. Sandu and Alina love the turn of the century cameras, more as art objects versus their initial function. They are building the collection as a legacy for their children and Sandu believes that by the 2020s or 2030s, virtual museums will be the popular thing. Cameras and photography have come to Sandu as a hobby. He is interested in the evolution patterns and the mechanics. He repairs some of them and even has several repairs manuals from the 1970's. Both Alina and Sandu used film, but now find digital is more convenient. Sandu is trying to mix old with digital by putting sensors in old TLRs. The results are often not that fantastic but it's the challenge that Sandu finds worthwhile. He enjoys Hasselblads as well and with those, he has followed a more mainstream digital back route. Sandu also notes that with his interest in the cameras' technical capabilities, he is starting to recognise cameras simply from their shutter “music”. Leigh was introduced to Photography with the family’s Six-20 Brownie Junior in the early 1960’s. His first photograph that he remembers was of a model boat that he had made. Leigh found it fascinating to process and contact print the films and his interest developed. On his 12th birthday, he was given a Kodak Instamatic 104. This was soon complimented by a Vinson Junior enlarger. A second hand Asahi Pentax H-2 followed and then later, an Asahi Pentax SV. 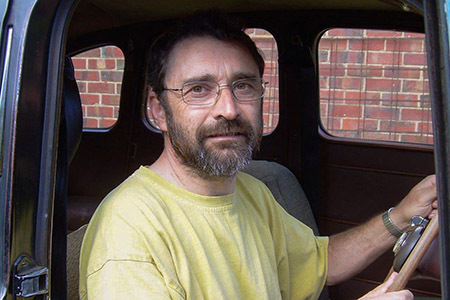 In the early 1980’s, he completed a Bachelor of Arts degree in Illustrative Photography at R.M.I.T. (Royal Melbourne Institute of Technology) which primarily focused on advertising illustration. A couple of part time jobs with car and fashion photographers followed, then a short full-time position with a product photographer, mainly catalogue work; photographing washing machines and the like! This took a toll on his enthusiasm and he reconsidered what creative possibilities lay outside the advertising industry. Instead, he returned to the family engineering business, manufacturing textile measuring machinery, and decided to keep photography as a serious hobby. Leigh's “collecting” began with the Kodak Box Brownie and he became a member of the A.P.C.S. (Australian Photographic Collector’s Society Inc.) in the 1980’s. A memorable experience was a 5½ week trip to the USA in 1991, visiting various camera shows, dealers and collectors, including Jim McKeown and the late Eaton S. Lothrop Jr. He came home with another 40 Box Brownie cameras, some of which he had never seen before. Leigh still has his first Box Brownie, along with nearly 300 others! With the Yashica TLR’s, there’s a different level of interest due to their more “precision” mechanical and aesthetic aspects, but they also satisfy his “rivet-counting” in a similar way. He began collecting the 66 models in 2007, with the acquisition of a Yashica 24, and since then has enjoyed researching their fascinating history. Leigh's current “usable” equipment includes a Linhof 5x4, Mamiya 7, and Olympus OM-2n and a home-made bakelite pinhole camera. He hasn't taken digital seriously - yet! Chris' interest in photography began at age 7 while on a family trip to California. His dad showed him how to use his Polaroid Pathfinder 110 camera - and he was hooked! Chris still has some of the first pictures he ever took as well as that Polaroid. His first camera was a Kodak Instamatic 100 which took literally hundreds of images from standard family snapshots to still life pictures of his toys and airplane models. 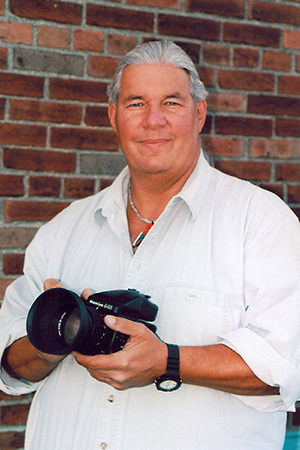 While attending college in Florida, Chris took advanced photography classes that included developing and printing colour and black and white film and colour transparencies to photo documentation and photo essays. All this was done with his first 35mm camera - a Nikonos II with Sekonic light meter! Quickly realizing that a more advanced camera was necessary, Chris purchased his first Yashica - a TL Electro-X. 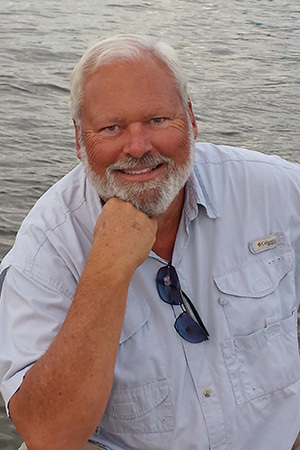 After college, Chris joined the United States Navy as an aviation forecaster and later served as a tropical meteorologist and finished his 22 year career as an oceanographer supporting submarines. While stationed in Japan in the late 1970s, Chris caught the camera bug big time! Wanting to upgrade his Yashica in 1978, he was not impressed with the new Contax RTS and so the jump was made to the Canon F-1 and a bevy of Canon lenses and accessories. Chris' Navy career took him around most of the world and his trusty Canon was there to document it. After his Navy career ended, Chris became a broadcast meteorologist on a local television station in Florida. His broadcast career wound down and now he enjoys semi-retirement and can indulge in his photographic passion nearly full time. Chris is a self-confessed “Yashicaphile” and is addicted to eBay! He mostly collects Yashica 35mm SLRs from the Pentamatic to the end run of the M42 mounts. His TLR collection has focused on classic examples from the pre-1958 period and in particular, Chris prefers complete sets in near mint condition - original boxes, warranty papers, instruction booklets and sales brochures and advertisements. His favourite cameras now are his Samsung Galaxy S4 camera phone and his point and shoot Sony! Chris still uses film - a Canon A-1 and of course, a Yashica thrown in for fun.